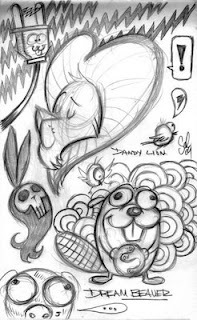 The Tanoshiboy Chronicles: Design & Illustration Blog: The mess in my noggin. The mess in my noggin. You know how you jot down ideas for something your working on and naturally new ideas start to come forth, so you just join those with the rest? This sketch was exactly that. Random ideas all scattered together. Hope you like. Keep spreading the word on LeadRocket and get us some more joiners. Thanks guys!